HSBC (NYSE:HSBC) reported better-than-expected results for the third quarter earlier this week, as the geographically diversified banking giant’s decision to focus on China over recent years – especially in the rapidly developing Pearl River Delta region – is now driving the top line. While revenues for HSBC’s cornerstone retail banking and wealth management business (RBWM) saw a sequential reduction, revenues for RBWM operations in Asia nudged higher – helping Asia’s share of total RBWM revenues increase from 48.2% in Q2 2017 to 49.2% in Q3 2017. As the net interest environment in HSBC’s home market of Hong Kong is showing signs of an improvement, we expect additional revenue gains in the current quarter to help this figure cross 50% for Q4. Additionally, HSBC did well to report total securities trading revenues that were nearly identical to the figure a year-ago – bucking the trend of a ~20% reduction in these revenues across the industry due to low volatility across global capital markets. But HSBC’s results also highlight the headwinds faced by its operations outside Asia. Notably, the bank’s operating profits from all regions besides Asia were sequentially lower. This was largely unexpected, given the fact that improving net interest margins in the U.S. as well as U.K. should have had a positive impact on the top line. Also, HSBC reported a slight reduction in its common equity tier 1 (CET1) capital ratio figure from 14.7% in Q2 to 14.6% at the end of Q3. Taking into account all these factors, we stick to our $48 price estimate for HSBC’s shares, which is slightly below the current market price. 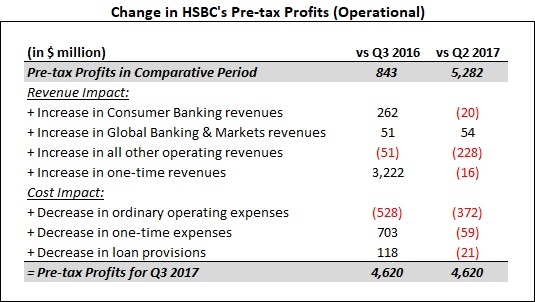 The table above summarizes the factors that aided HSBC’s pre-tax profit figure for Q3 2017 compared to the figures in Q3 2016 and Q2 2017. It should be noted that HSBC’s profits for Q3 2016 were unusually low as they were peppered by a list of one-time charges, including a $1.74 billion loss on disposal of Brazil operations and a $1.37 billion accounting loss from a revaluation of its own debt. Adjusting for all one-off items, revenues shrunk in Q3 2017 compared to the figure a year ago, even as operating expenses increased considerably. An important reason behind this trend is the fact that HSBC’s operations in Europe and North America are losing ground. While the bank has strategically chosen to reduce its presence in these regions, it has also had to incur additional costs to consolidate its presence in key areas. The chart below highlights the changes in HSBC’s operating performance by geography. The bright spot in HSBC’s operating performance for Q3 2017 was the strong showing by its operations in Asia. While the bank’s investment in China helped retail as well as commercial banking revenues from Asia grow steadily, HSBC’s stronger presence in Asia compared to other global investment banks also helped its Global Banking & Markets business division weather the weak demand for securities trading services in the U.S. and Europe. That said, one of the key areas of focus unveiled by HSBC as a part of its long-term reorganization plan in June 2015 was slashing costs. The bank set itself a target of reducing annual recurring costs by as much as $5 billion by the end of 2017, and has made considerable progress on this front through the disposal of non-core units while also streamlining its business model. However, the stricter regulatory environment globally has also forced the bank to increase its headcount for regulatory and compliance-related operations – leading to higher overhead costs. Higher compliance costs, along with increase performance-related payouts, were an important reason for a year-on-year increase in HSBC’s operating expenses for Q3. You can see how changes to HSBC’s commercial banking expenses impacts our price estimate for the bank my modifying the chart below.